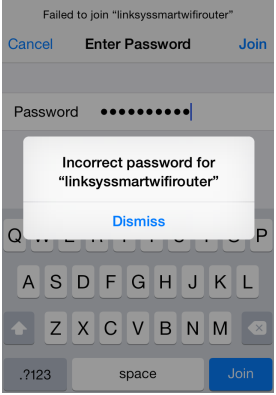 But iPhone did not accept the network password to let me join, even I entered the correct password manually also. See also: Cannot join hidden network? Do you have other devices and are they connecting the same Wi-Fi without any problems? Make sure that Auto-Join is turned on. Go to Settings > Wi-Fi and find your Wi-Fi and tap the info (i) icon next to it and turn on Auto-Join. Weak Wi-Fi signals may cause this. Move closer to your router, does this fix your problem? if it does, then your problem is poor Wi-Fi signals. Turn off Airplane Mode, wait a few seconds and then turn back off by going to Settings > Airplane Mode. In iOS, tap Settings > Wi-Fi, then find your connection and tap the info (i) icon next to it and tap Forget This Network, tap Confirm and then try to reconnect. Your iOS device (iPhone or iPad). You can shut down your device by going to Settings > general and scroll down and the tap Shut Down. Then start your device. Restart your router and Modem. Unplug your router (and modem) from its power source. Wait about one minute. And then reconnect by plugging them back into the power source. Some modems have backup batteries. If your modem has batteries, remove these as well. Wi-Fi interference from other connections many cause this problem. Restarting your router will likely fix this. Make sure that your router has the latest software. Check your router’s manual to see how you can update. If you are still having problems, reset your network settings. Please note that doing so will remove your settings (e.g., your Wi-Fi passwords etc). Simply go to Settings > General > Reset > Reset Network Settings. Do not worry, you will not lose any data. Check to see if your router has MAC filtering enabled, turn off Mac filtering (Media Access Control) if it is on. Mac filtering limits the devices. Please note that this is mostly disabled by default. See your router’s manual for more information regarding this. Apple recommends this disabled. See also: Cannot connect to a known network? If you are having problems, contact Apple support. You may chat or make a Genius Bar appointment. Last night, 11/13/2018, that happened to me too, on my iphone X with my 5GHz network right after I arrived home. Prior to that I did NOT change the wifi password in my router. I very carefully and slowly entered the wifi password 3 times and still received the incorrect password entered. So, this worked: I selected my 2.4 Ghz wifi that has the exact same password, and it connected automatically ! I changed back to my 5Ghz wifi and it connected automatically !! I have same problem. My samsung phones do not have this problem. I have to spend few hours to figure it out. IOS devices working fine again ! none of these steps work. ugh. everything, all of my apple devices just slowly, one by one, started to disconnect from my wi-fi even though all of my TVs and my desktop are connected. I have obviously not changed my password…and I was literally just on the phone with Apple solving another issue. It involved me completely restoring one of my ipads, one of the steps, not 30 minutes prior, was to access my wi-fi, re-enter my password (the same effing one which isn’t working now) and everything was FINE! Mine started last night too! Coincidentally right after I download Mojave to my Mac. Same boat here. The only device not connecting to 2.4 is my iPhone. I have 6sPlus. After much research it seems common with these phones. This is the third time in a year this has happened to my iPhone, my iPhone only. Yes my iPhone will connect with 5 band but it’s much shorter distance so I lose WiFi as soon as I go to other areas of our home. This is what I know for sure, our router & modem are working fine, my husbands iPhone 7 & my sons 5s both are not having any troubles, only my 6sPlus is. I have not touched anything, literally I was knocked off out of the blue, phone forces me to enter password but won’t accept CORRECT password. About 5 months ago this happened to me for two long weeks. I had Charter come out 3 times, they proved to me it’s not them or router/modem. They said next visit I’d be charged. I am soooooo tired of this. I don’t pay hundreds of dollars for a phone that can’t work properly. I have a love/hate relationship with iPhones, honestly I can’t rely on them and I need a phone that’s reliable. Yes phone is updated. It IS my phone otherwise every other device in home would be effected. Yes, I’ve done everything suggested as I did the last two times this has happened to me in the last 12 months. The last two times we were never able to “fix” it. It simply started working out of the blue just as it screwed up out of the blue. Last time I had netgear and charter and apple try to help with no avail. I’m actually angry now. By researching, many many others experience the same thing, so tell me please why has this not been addressed/fixed. I’m tired of the finger pointing. Apple won’t take responsibility, nor Netgear, nor Charter, while their customers are without WiFi! Lastly, I’ve said this for countless years, Apple needs to do updates where the Apple executives & employees “try it out”, first, then when all the bugs are fixed, then it goes public. I have no doubt things would be fixed much quicker. I’m also sick of people like me explaining exactly what they are dealing with, state what they’ve tried to do to fix it and someone has the audacity to ask if they are inputting the correct password. Maybe the respondents should read before they reply. It would be nice to hear from someone that actually knows what the real solution is. All researched answers are the same, but no one has the real resolution. We obviously have tried everything suggested, it’s not working people! Sorry for my rant but honestly I’m disgusted. Same with me… I am going over to Samsung now. I am sick of this! I turned my phone on then off again because my bluetooth wasn’t working however when my phone turned back on it went to the screen you get when you first purchase an iPhone, its telling me to enter my password for WIFI otherwise I cannot use my phone and I’ve typed my password in so many times but it keeps saying incorrect when I know that is 100% correct. so now I’m unable to use my phone at all, can anyone help me please? Same hear , Apple do not care switched from Samsung so much better , bye Apple ! It’s all about the money money money money money!!!!!! This has to be some kind of a bug. I got a new router and all of a sudden this problem started to happen with on my iPhone 8. My wife’s iPhone 7 and iPad are fine. Something is not properly connecting specifically on iPhone as other devices are fine.